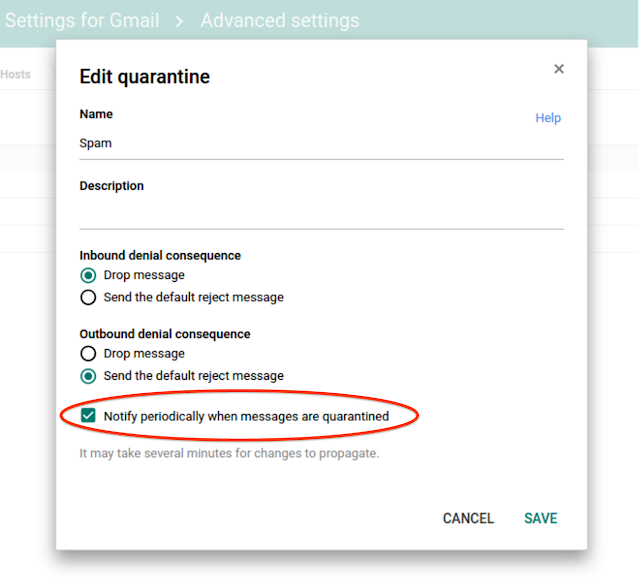 have requested email notifications when mail messages are quarantined. Beginning this week, we’ll be rolling out a new setting in the admin quarantine that will let you do just that. These email notifications will make it easier to quickly take action on certain email quarantines which may be more severe than others. Based on your organization’s needs, you can enable notifications per each quarantine. Once enabled, admins will receive an email notification within an hour of when an email is quarantined. The frequency and timing of the alerts will vary based on how often new quarantined mail arrives, but will never be more than once hourly. We recommend only enabling email notifications for the quarantines that need to be actioned immediately. Also, the admin quarantine is getting a new look and feel to make the quarantine logs easier to read. If you have additional suggestions, please send us feedback about this new look using the “Send feedback” link. Many administrators who use admin quarantines have requested email notifications when mail messages are quarantined. Beginning this week, we’ll be rolling out a new setting in the admin quarantine that will let you do just that. These email notifications will make it easier to quickly take action on certain email quarantines which may be more severe than others.